A look at the main UK housing market data. London showed strongest housing market with prices rising more than other areas. 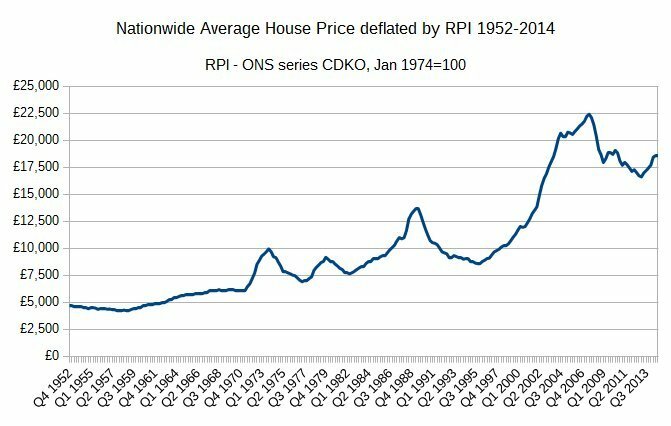 In 1975, average house prices were: £10,388. In 2016, average house prices are: £198,564. 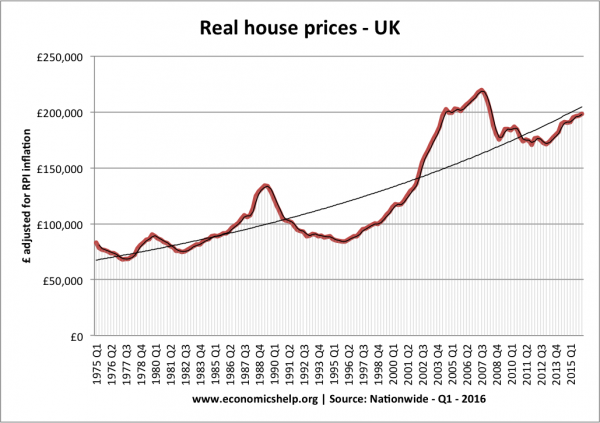 Real house prices are adjusted for the effects of inflation. 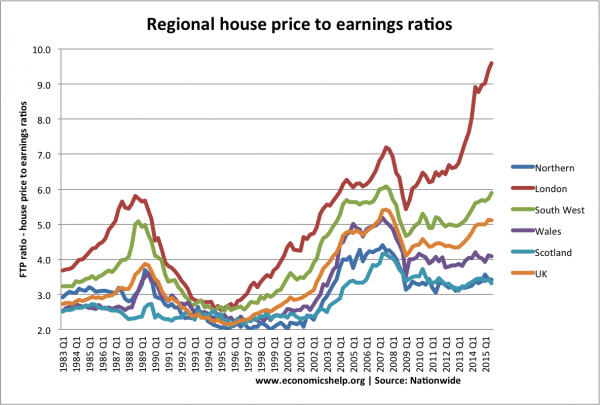 This gives a more meaningful guide to how house prices have increased compared to typical prices in the economy. 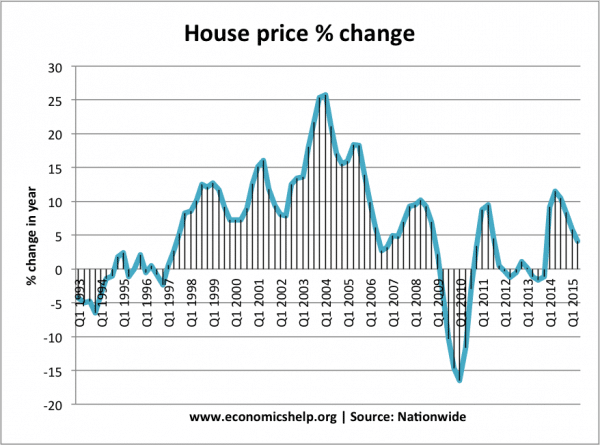 This shows the real increase in house prices – rising faster than inflation. 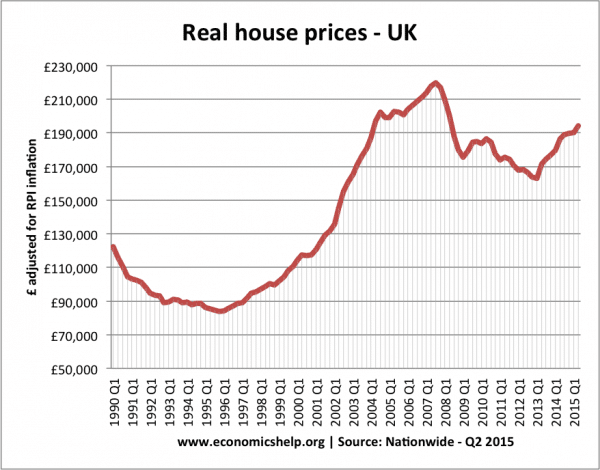 In 1975, – average house prices (at 2014 prices) was £83,126. 126% increase in real house prices. 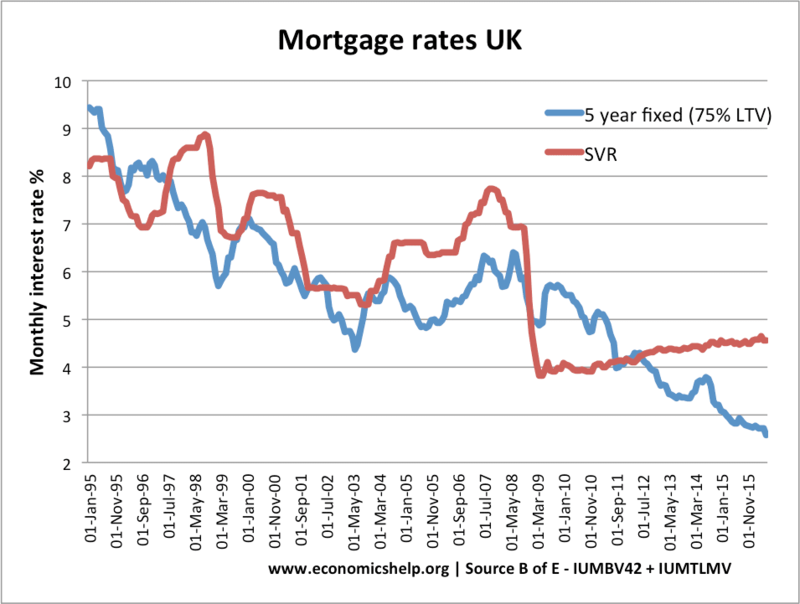 For UK first time buyers, the average house price is 5.1 times average earnings. 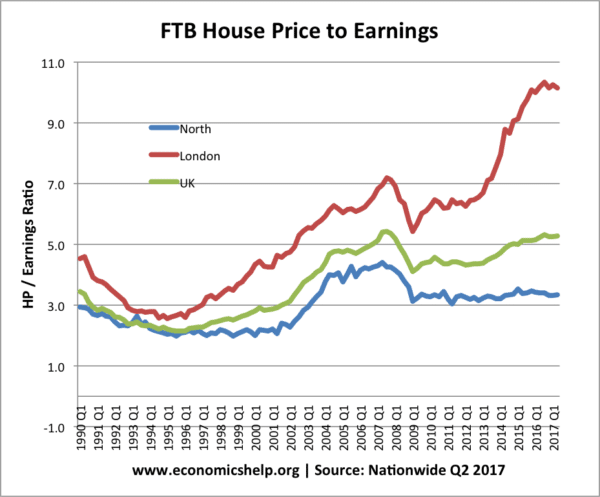 In London, house prices are 9.2 times average earnings, whereas, in the north, house prices are only 3.4 times average earnings. Mortgage payments as % of income reached a peak in late 1989/90 due to record high-interest rates. 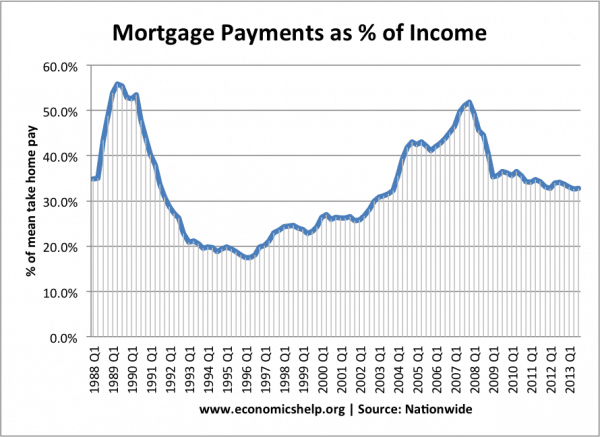 Rising house prices meant that the % of mortgage payments grew in the 2000s. 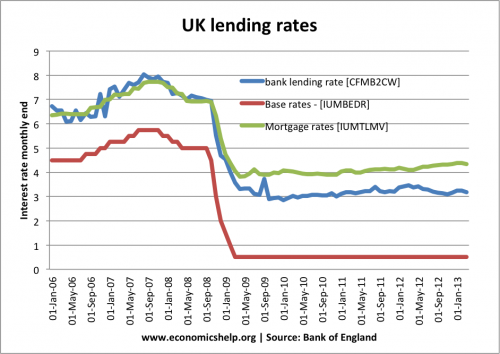 However, in 2009, interest rates were cut to 0.5% leading to lower mortgage payments for homeowners. 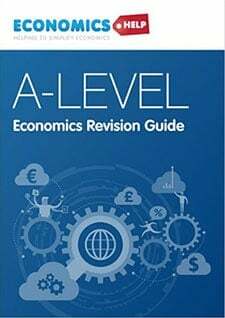 There has been a dramatic fall in Bank of England base rates (which has continued to remain at 0.5%) but the bank’s standard variable rates have fallen at a much lower rate. See more at explaining the gap between base rates and commercial lending rates. 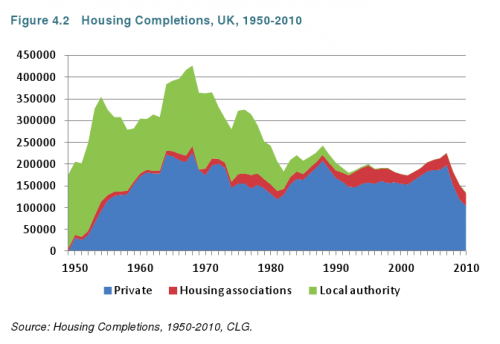 During the post-war period, construction of local government housing increased supply. 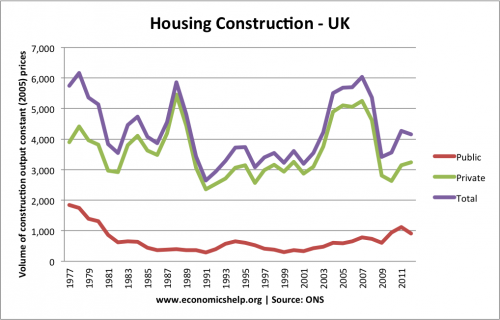 Home builds reached over 400,00 a year in the late 1960s. However, from the 1980s, the government retreated from building houses, leaving it to the private sector and a small contribution from housing associations. 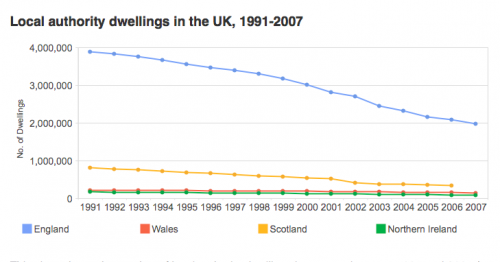 Due to strict planning legislation, the supply of housing has failed to meet government targets. For example, in 2007, the government estimated they would need to build 240,000 homes a year until 2016, to keep up with growing demand. 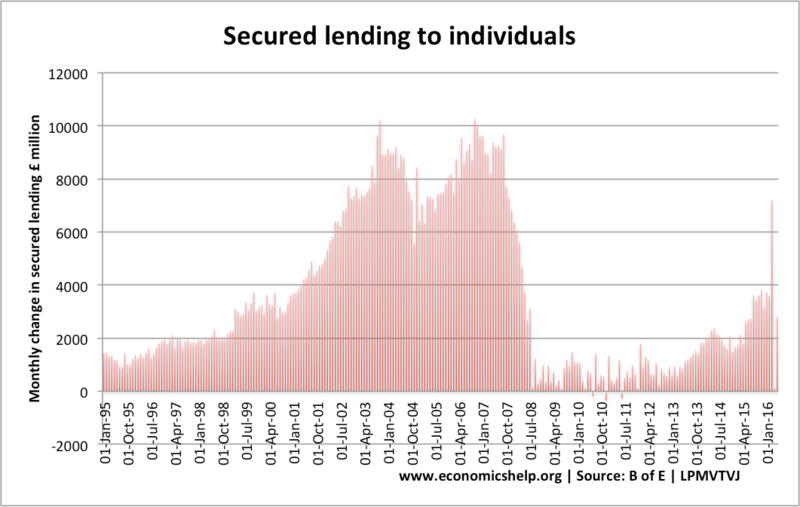 However, after the credit crunch, housing completions fell to 100,00 a year. 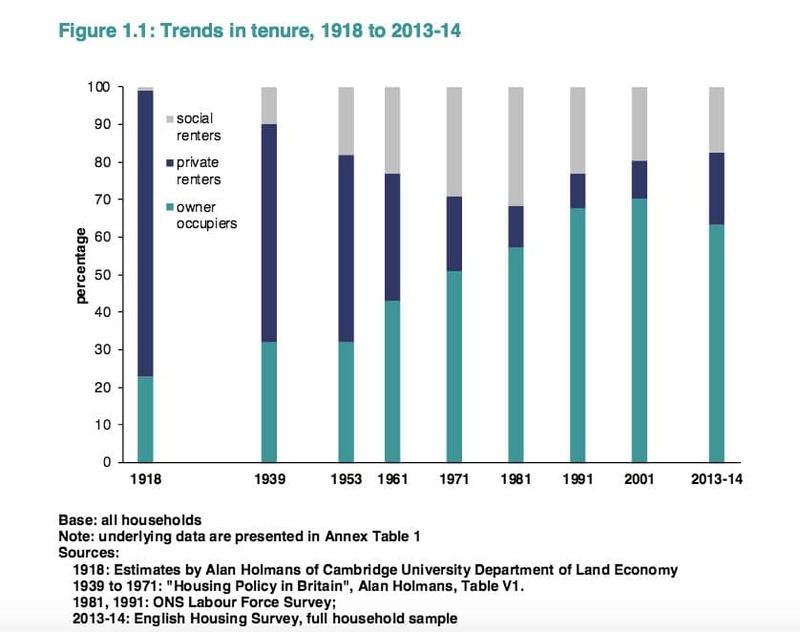 Between 1950 and the early 1980s, the percentage of homes which were bought, steadily increased, and the renting sector fell. Mrs Thatcher encouraged this trend in the 1980s, with a policy of encouraging home ownership and selling off council homes. Mrs Thatcher allowed the sale of council properties to their tenants. 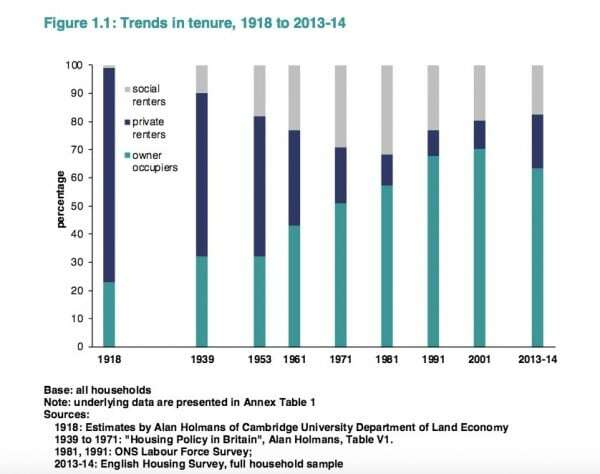 The stock of social housing has fallen since the early 1980s. However, the trend in home ownership has been reversed in the last decade, due to declining affordability of home ownership. 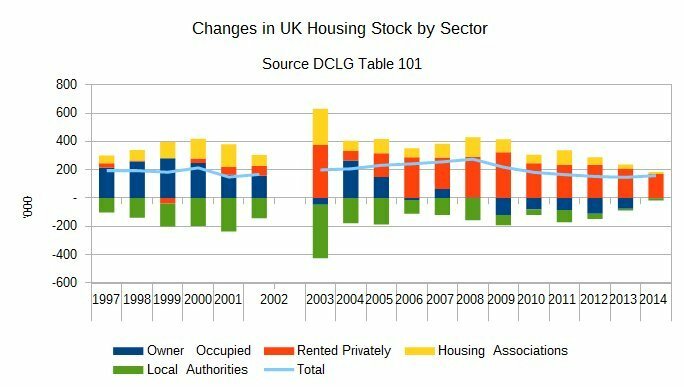 local authority housing stock has plummeted due to the popular right to buy scheme and transfer of housing stock to housing associations. 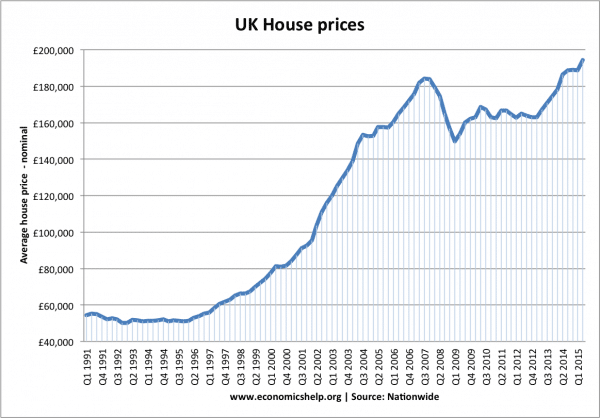 The volatility of UK house prices. 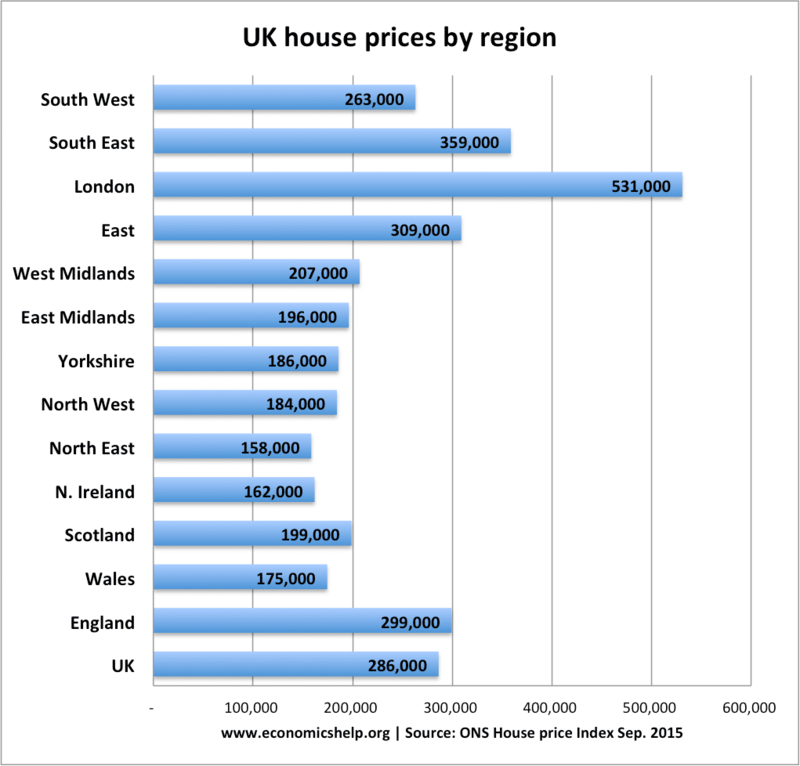 Though it should be noted these statistics show nominal house price changes. 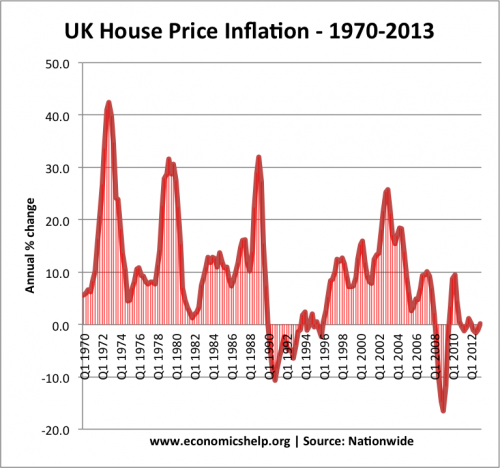 In the 1970s, high inflation rates magnified the nominal house price rises. 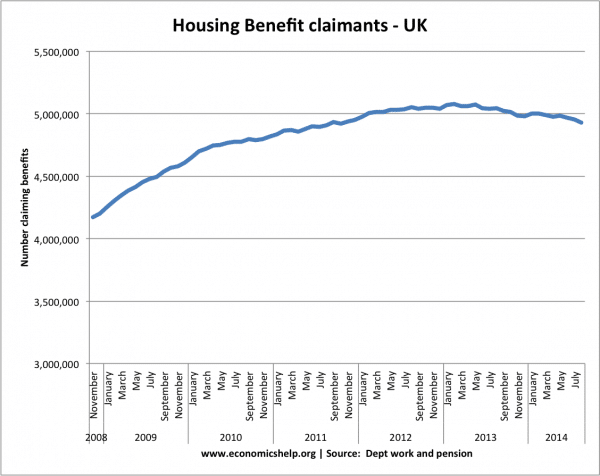 Just under 5 million receive housing benefit, at an average of £93 a week. This is a rough annual cost of £23 billion. 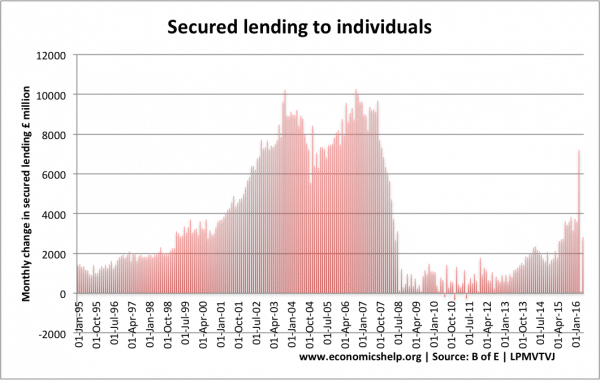 Collapse in mortgage lending post 2007 financial crash. This entry was posted in housing, stats and tagged housing, stats. Bookmark the permalink. Is there a chart for number of transactions, ideally going back up to 30 years? 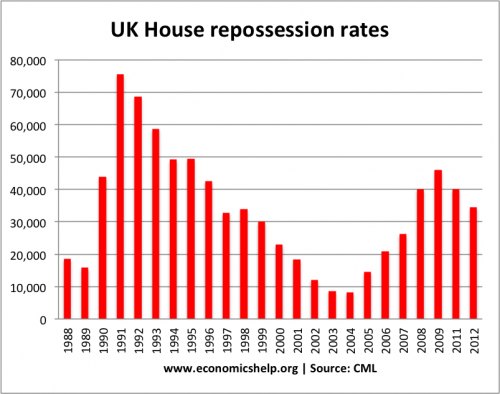 concerned about the inevitable bubble, with people buying up second homes because ‘theres no better investment than property’ would be interesting to see if it compares with 2005-2007. may be helpful in predicting the next burst of the bubble. of course it could be on thursday if we leave the e.u.! 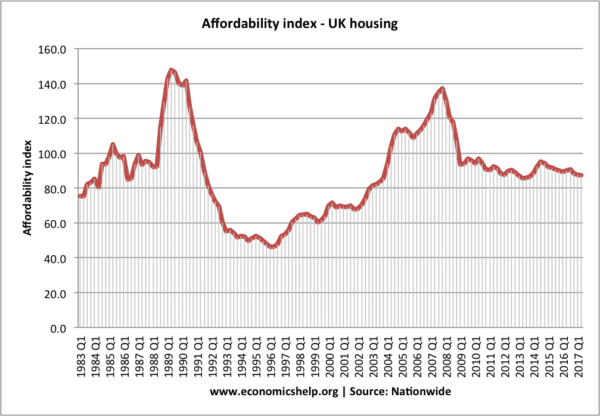 Shows that the “housing shortage” is a myth. 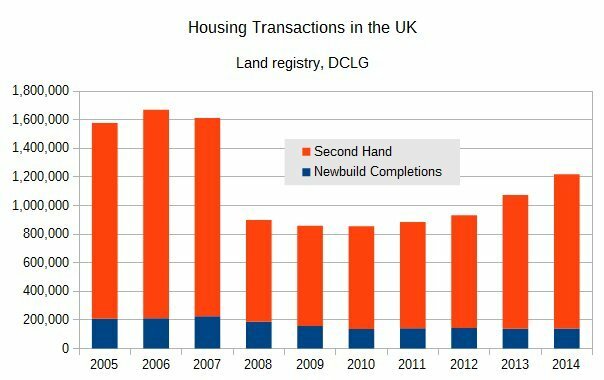 Shows that Council Housing has continued to transfer to Housing Associations, while BTL has been buying more than the total of new builds. 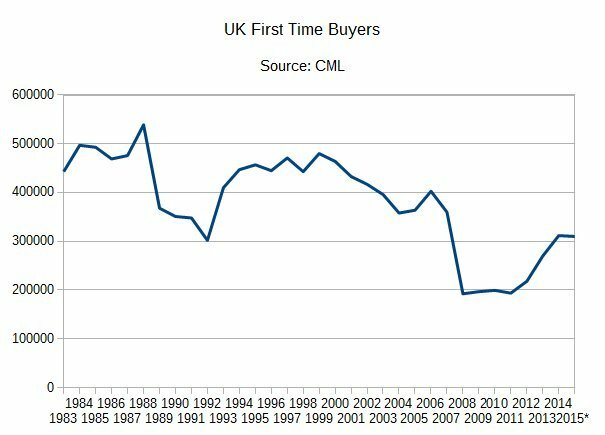 Numbers of first time buyers have stayed subdued, and well below the 400,000 a year that the CML had projected in a study in 2006. Most sales are of second hand homes. Most supply of homes for net sale comes from executors and emigrants, not newbuilds. 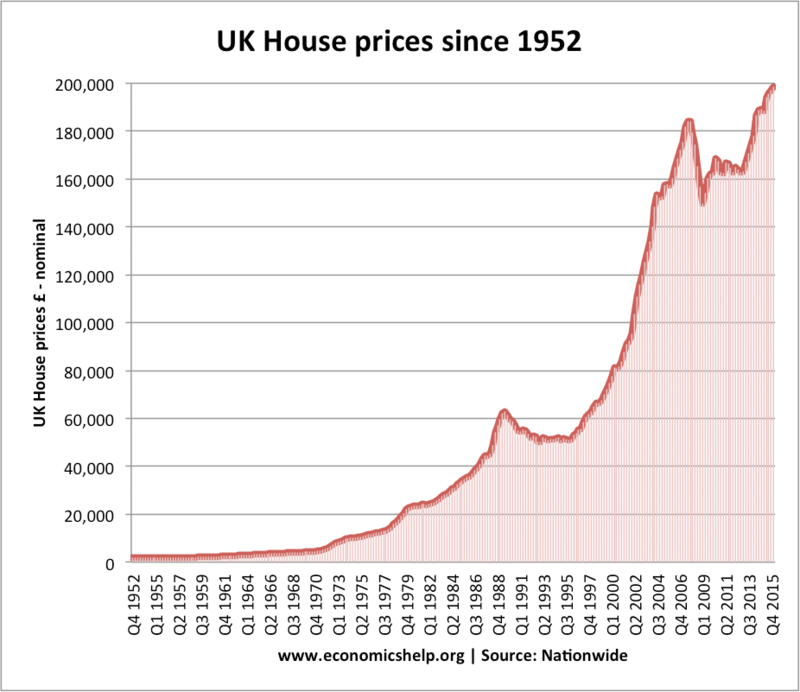 Real house prices back to 1952. 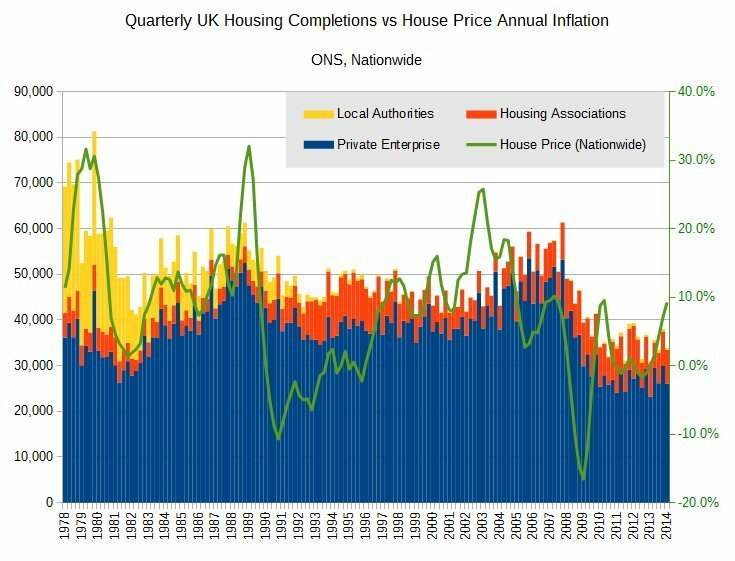 Evidence that housebuilding does not cause house prices to fall – if anything, the relationship is the other way round: higher prices lead to an increase in building. 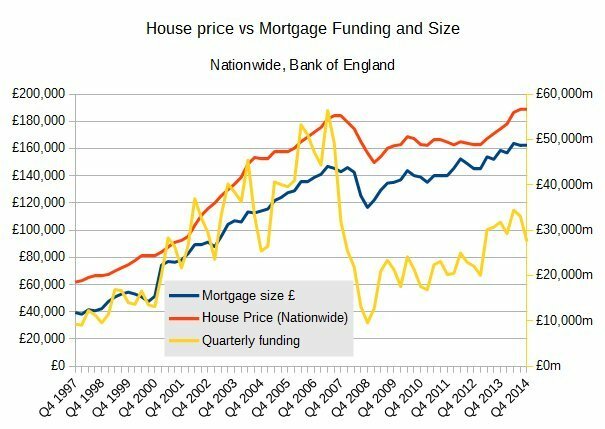 House prices are driven by the amount that banks will lend per mortgage – note this dropped after the financial crash, and so did house prices. You can’t pay what you can’t borrow. As with a previous commenter, it would be interesting to see income levels versus rent levels and house prices, over say the last 10 years, but by city. 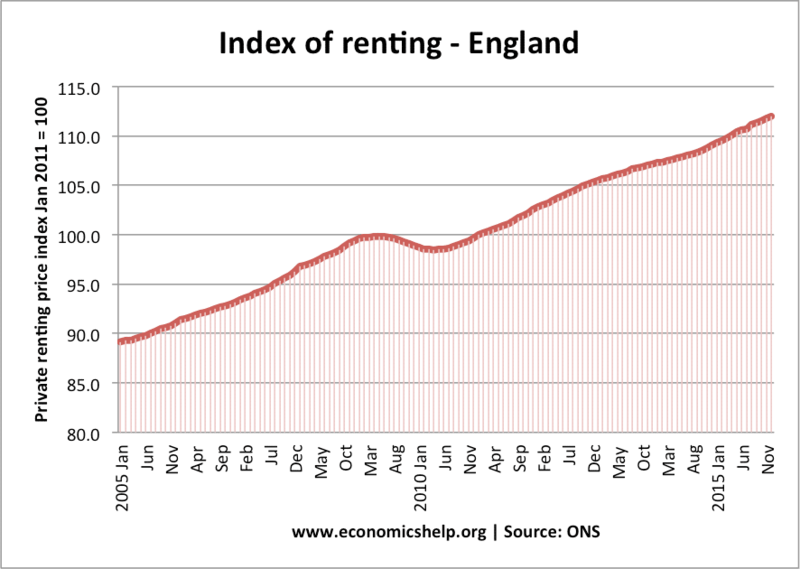 Using Bristol as an example, house prices have increased and rent levels have gone up way beyond what Housing Benefit will pay. 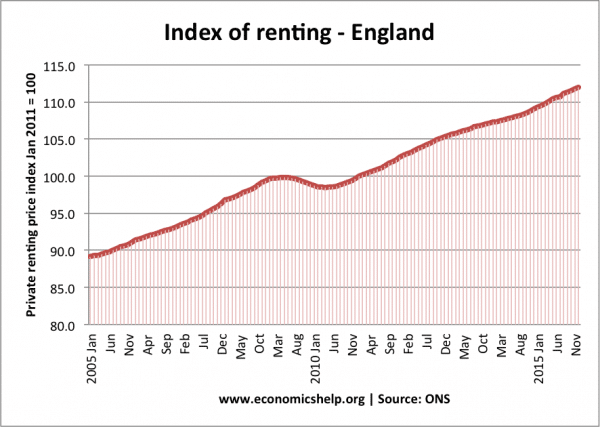 As a result, rent is unaffordable – let alone deposits, and there has been a huge increase in homelessness applications. However, since the number of local authority properties is declining, there are less options available. Resulting in 10,000 people on the waiting list for housing – and that’s after the city council culled 5,000 people that had ‘no chance’ of being successful in obtaining an LA property. 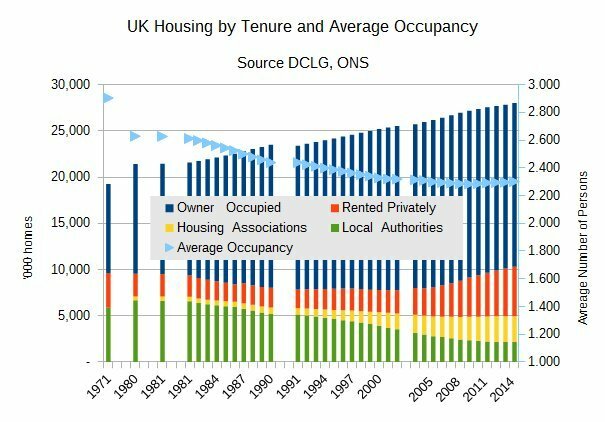 People are increasingly unable to afford to live in the city in which they work, as has happened with London. However, income in London seems to be adjusted to accommodate this when elsewhere income doesn’t seem to have increased to anywhere near enough to keep up. Is the same thing happening in a city of a similar size such as Sheffield, Leicester or Derby. Are people being priced out of cities? 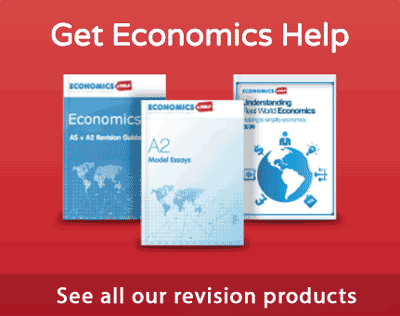 Is there a difference in the economy growth rates between cities? This is a very interesting study! It will be beneficial for those who are planning to buy properties in UK. 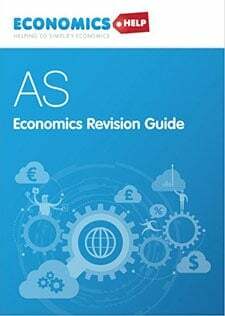 They can now compare prices and trends in different places in UK. Great news for those looking to sell, but in many places it presents more of a barrier for anybody trying to move up the property ladder. How many people are now being priced out of these areas? It would be interesting to see income levels versus rent levels and house prices, over say the last 10 years, but by city. 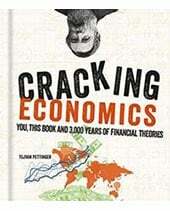 We’ve now reached prices above the economic crash in 2008, can it keep on rising much past this point now? 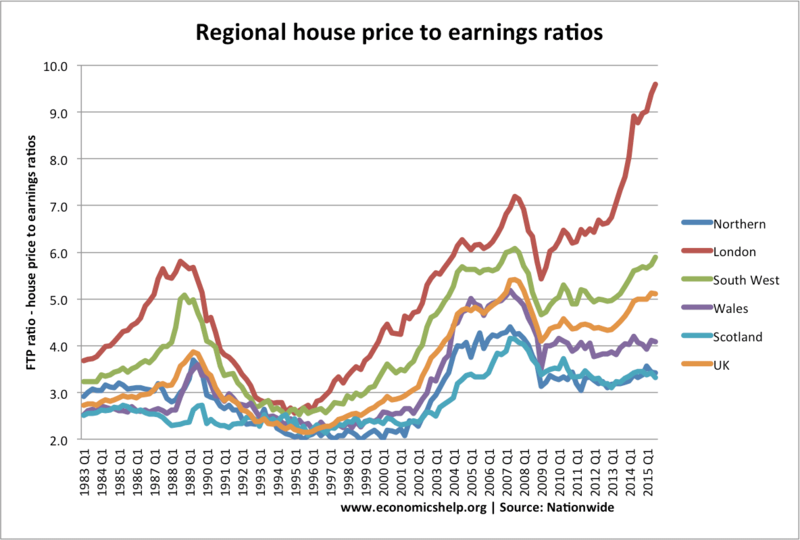 Regional house price graph is really useful. 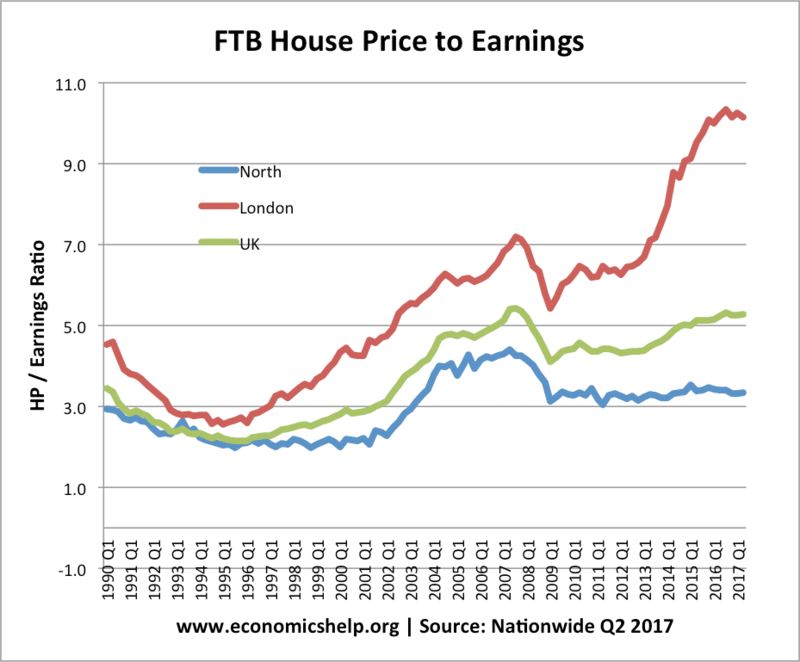 It seems a average house price to average earning ratio of 5.1 times is the level at which we see prices topping out broadly speaking with the exception of london. 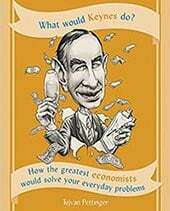 Is there any graphs on supply and demand in the housing market in recent years?